Mongolia, while a traditionally Buddhist country, faced decades of religious oppression in the 20th century. The importance of Mongolia’s spiritual leaders during that period, however, did not decrease. Özer Rinpoche explains the significance of His Holiness the 9th Bogd Jetsün Dampa Rinpoche and the mummification of his holy body. When I was still staying in Dharamsala, India, I was invited to teach at Tamkang University in Taiwan. I was presented with a Taiwanese visa and had booked my ticket to Taiwan. However, His Holiness the 9th Bogd Jetsün Dampa Rinpoche (Khalkha Jetsün Dampa Rinpoche) asked me to support him in Mongolia. I even got another invitation from the United States, but I cancelled everything as I had already accepted Rinpoche’s request. Rinpoche used to say to me that without my support, everything in Mongolia would be so difficult and that I should stay in Mongolia as long as possible. This is why I am here fulfilling Rinpoche’s wishes as best I can. One of my tasks, for example, is to continue teaching Chöd to Rinpoche’s students. The former Khalkha Jetsün Dampa Rinpoche lived during the time of Soviet communism. It was a very difficult and cruel time for Buddhists in Mongolia and the 8th Khalkha Jetsün Dampa Rinpoche had no freedom to teach Buddhism in public. Rinpoche died in 1924 and although almost all Buddhist temples were completely destroyed and so many monks were killed during the communist regime, it did not destroy the faith Mongolian people had in Buddhism nor their faith in Rinpoche himself. It wasn’t until 1991 that the Mongolian people learned that the incarnation of the 9th Khalkha Jetsün Dampa Rinpoche had been recognized, being born in Tibet in 1932, and had already immigrated to India, but still had a great wish to come to Mongolia to see his people. It wasn’t until 1999 when Mongolia became a democratic country and Mongolian people regained their religious freedom that his return could finally happen. Due to political problems and instability, Rinpoche’s first visit to Mongolia lasted only one month. He didn’t have any political intentions in mind when coming to Mongolia; his wish was to revive Buddhism, to reestablish the Buddhadharma in the minds of the Mongolian people and to reform monastic discipline. Unfortunately, Rinpoche only spent a short time in Mongolia before he passed away in 2011.The lineage will be carried on, although it is not yet clear by whom. Finding and announcing the reincarnation of 10th Khalkha Jetsün Dampa Rinpoche is handled by the administration of Ganden Monastery in Mongolia. I will be just a part of it, supporting the process wherever I can. His Holiness the Dalai Lama made the decision that the 9th Khalkha Jetsün Dampa Rinpoche should be mummified, a process not decided on or performed by just anyone. Mummification is not used for all lamas, only for the very highest of the high Lamas. 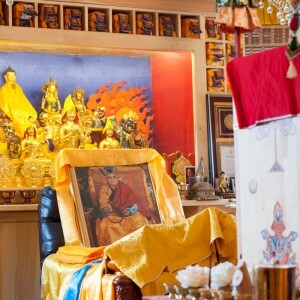 Rinpoche’s mummification will be finished around March or April 2013 and his holy body will be placed in the former library of Ganden Monastery, which will be open for the public to receive blessings. The science of mummification was taught by Buddha Shakyamuni. 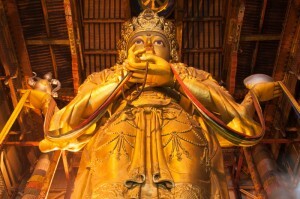 In Tibet, for example, Je Tsongkhapa and the 5th through the 13th Dalai Lamas were mummified. In Mongolia, the 1st through 8th Khalkha Jetsün Dampa Rinpoches were mummified, but unfortunately, were all destroyed during the communist period. The results of mummification are pretty amazing. In Tibet, one lama’s mummy hair had grown longer 400 years after mummification. The mummy of Lama Tsonghapa, even after 500 years, was still extremely fresh looking, just as though it were alive. 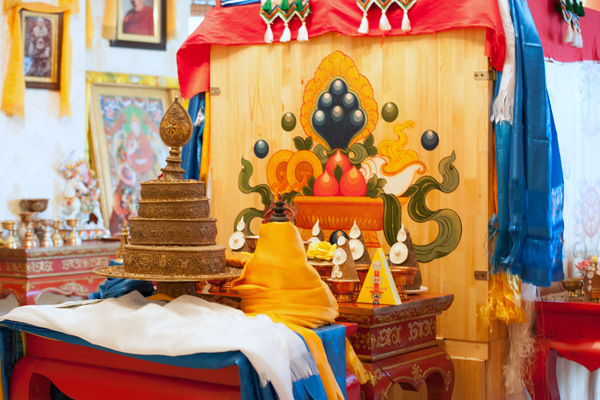 One of the advantages of the mummification of very high lamas is that students will be able to continue to make offerings to the Lamas to increase merit, helping the country to remain peaceful, prosperous and happy. However, if the body is not correctly mummified, the result is suffering and the reincarnation of the lama will face obstacles. Today people might think that we can mummify any of our lamas or even ourselves, but it isn’t like that. We have to understand who can be mummified and who can carry it out and what the process for doing it correctly is. 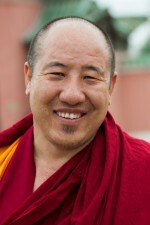 Özer Rinpoche is the is the recognized reincarnation of Jangchup Özer, one of the seven disciples of Je Tsongkhapa who founded Sera Me Monastery.